Last year Full Cycle took some bold steps to increase staffing, which allowed us to expand opportunities for young people experiencing homelessness while at the same time increasing the earned income capacity of our social enterprise bike shop. 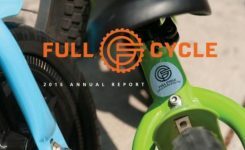 As you will see from this year’s report, we were able to accomplish a great deal more in our mission to connect with and support homeless youth, our community and our Earth through bikes, business and relationships. However, this came at a price. For the first time in many years, we also surpassed our financial support and ended the year with a deficit. While a deficit is always discouraging, the nature of a social enterprise will bring a mixture of surplus, deficit, and flat income years throughout its life cycle. Lessons were learned and we’ve been able to identify the contributors to this year’s deficit as well as solutions for the upcoming year with the goal of putting Full Cycle back on track to create surplus income that will sustain the current level of programming and contribute to the overall future financial health of PUC. Now more than ever, Full Cycle is depending on the relationships we’ve built over time with our funders, supporters and community. We look forward to working hard at the solutions we’ve created to support young people as they fight for self- sufficiency and independence, but need your support to do our best work.